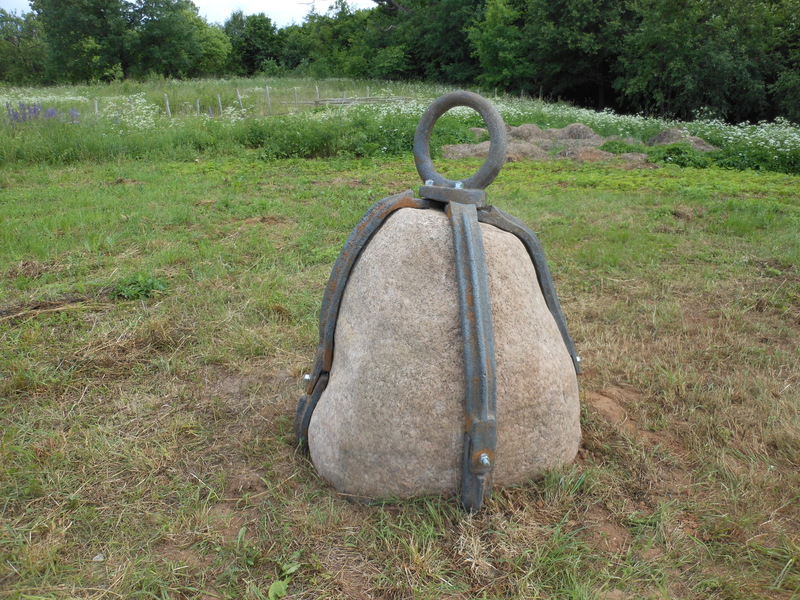 Firkspedales muiza: These are photos of sculpture from part of the Pedvale Open Air Museum, near Sabile, Latvia. My plans changed a bit from the initial proposal, which was to cast iron directly around the granite. 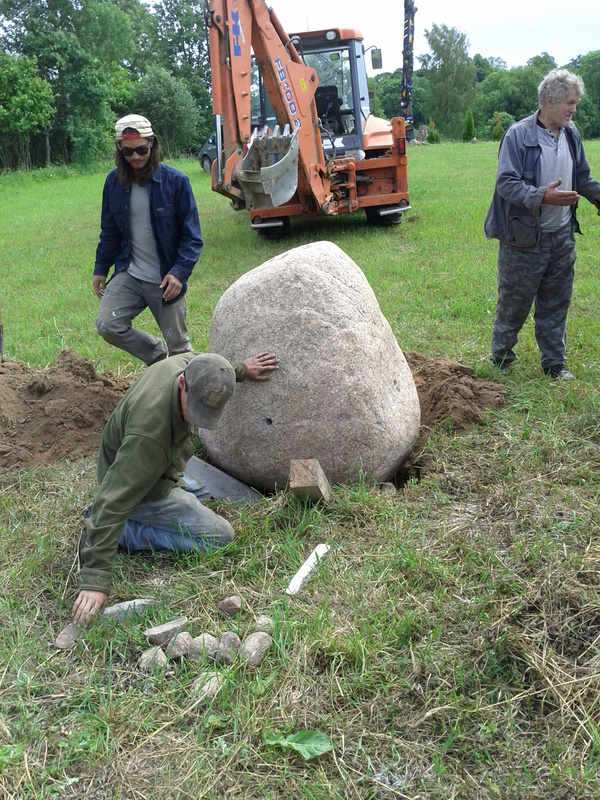 See my previous post about cultural resource management, and choosing the stone. 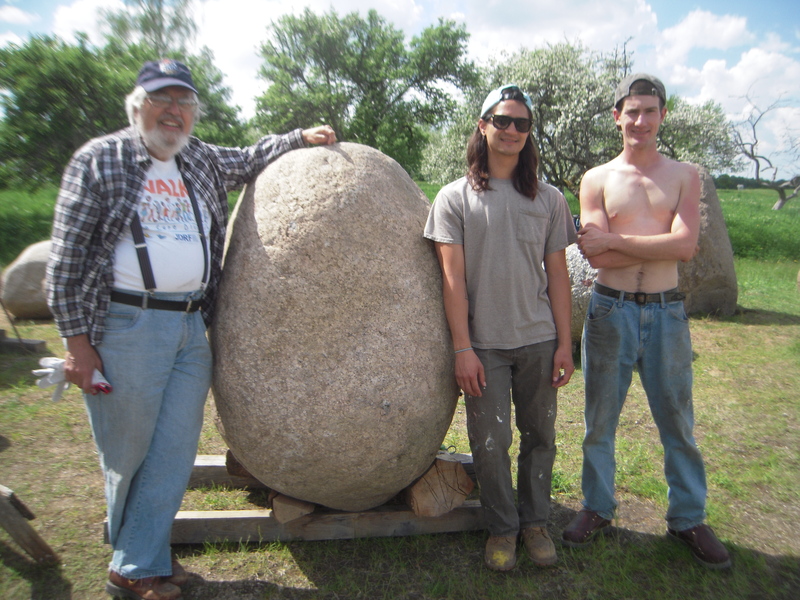 I could not have completed this sculpture without the help of my assistants, Sutton Demlong and Justin Playl. Both were highly recommended by Tamsie Ringler. The dimensions of the arms were changed from 3X6 inches to 4 inches wide. Four inch foam was available for pattern making, and I felt it best to use that, rather than cutting and pasting blocks of foam to make larger blocks. The ridges were suggested by Carl Billingsley. 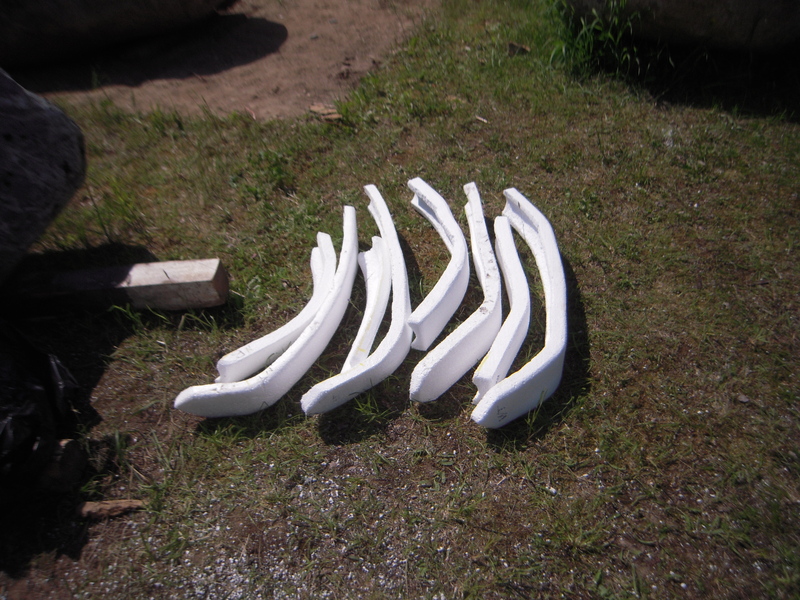 They added visual weight, as well as stiffening the foam patterns, allowing them to to rammed with a flat side down. 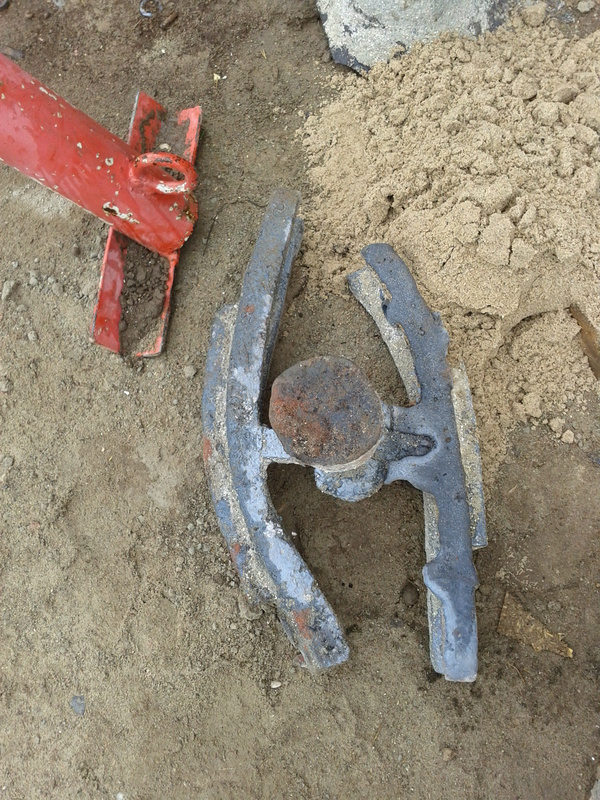 Each are was made in 2 sections, with a sliding joint to accommodate shrinkage due to casting. 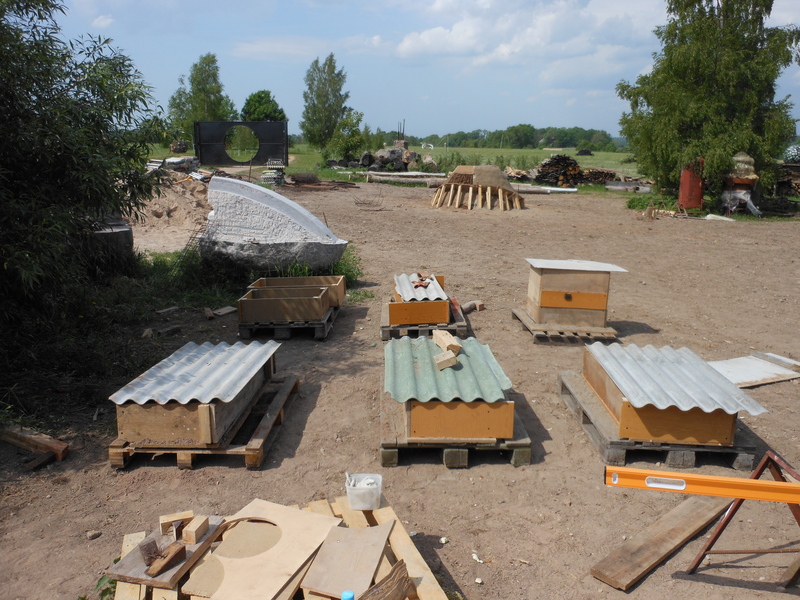 These are the drags, or lower parts of the molds. Sand was rammed in over the foam patterns, then the drags were turned over so that the tops of the molds (copes) could be made. The size of the ring was adjusted slightly, to make the proportions pleasing. 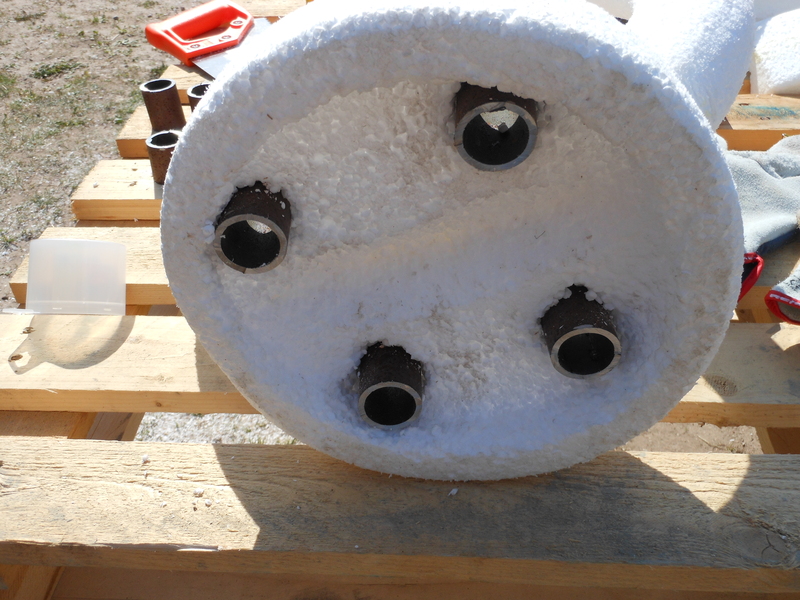 The lifting ring was re-designed and the foam pattern made by Justin Playl. 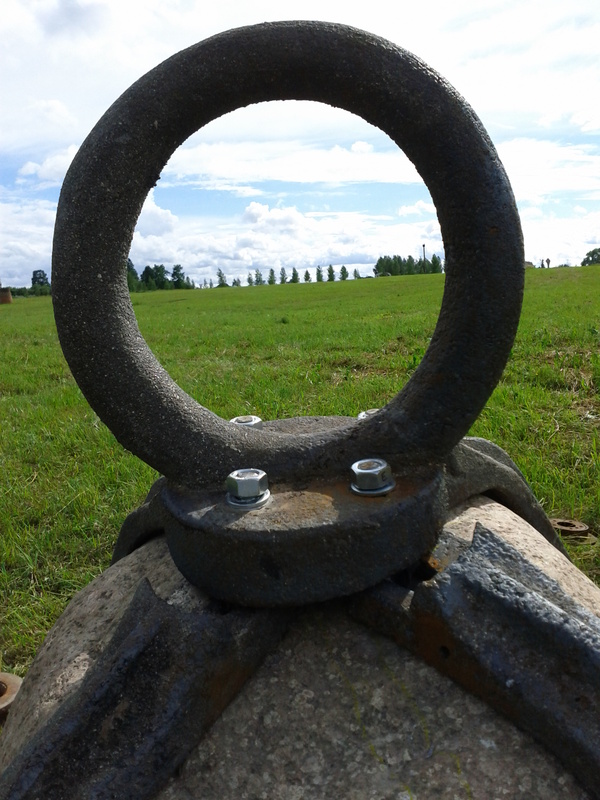 This became a rounded ring attached to a disk base, with 4 round holes. Pipe was cut to make steel inserts, which were cast into the base to make the holes. Threaded rods passed through these holes, then through oval adjusting holes in the upper arm, and were then anchored to the stone itself. We needed a jackhammer to drill the holes for mounting the arms. The lower part of the arms were made so that the oval adjusting hole was hidden behind the round hole in the upper part, and were also bolted to the stone. 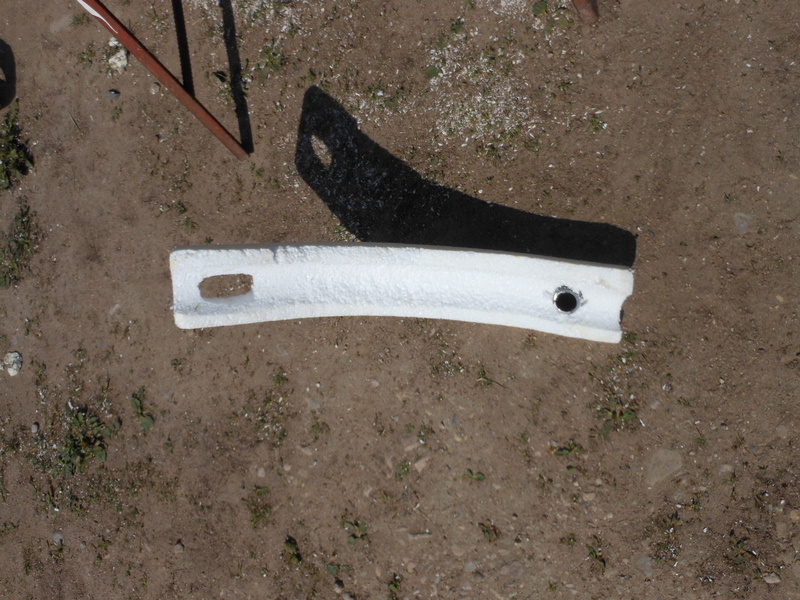 A piece of duraluminum was wired to the lowest end of the arm, to act as a sacrificial anode. 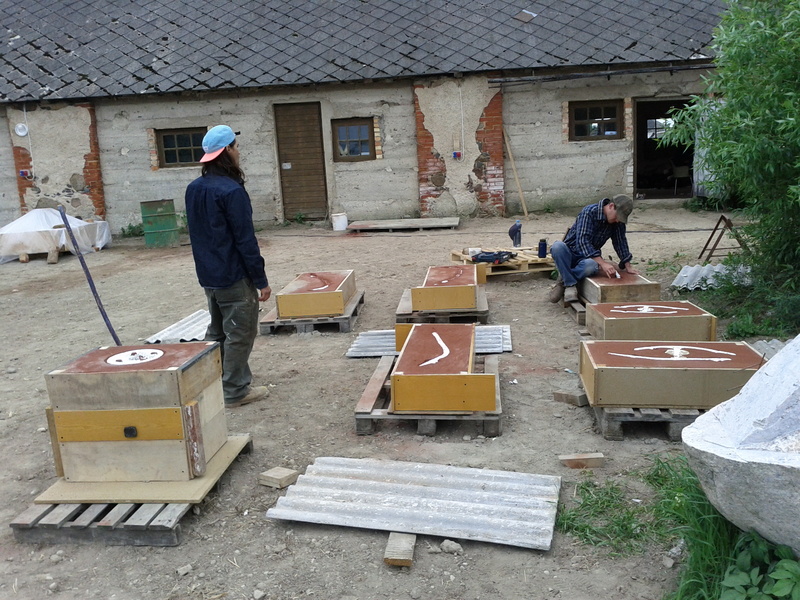 The foam patterns were fitted to the stone, and adjustments made before casting them in iron. 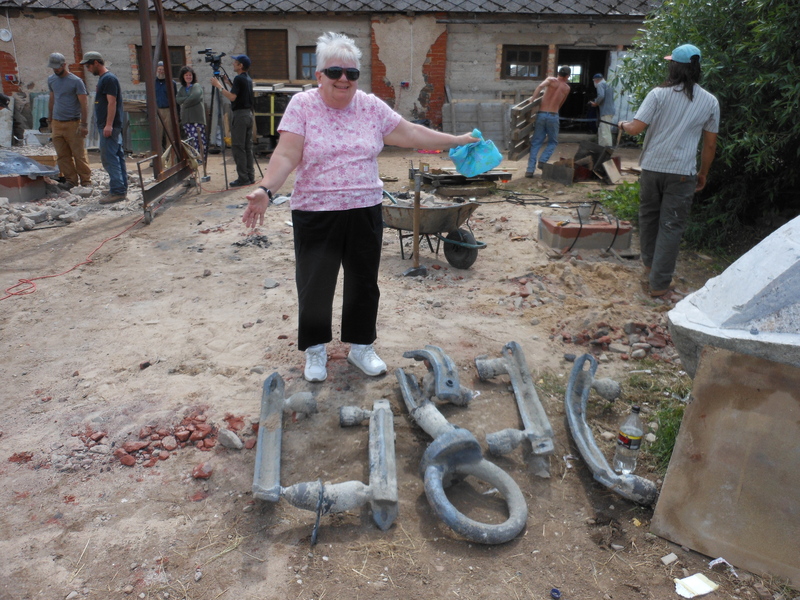 And here is Mary with most of the rough castings. The right hand side of this casting was poured in the second production pour. The left hand side filled properly in the first pour. The iron fit the stone fairly well. 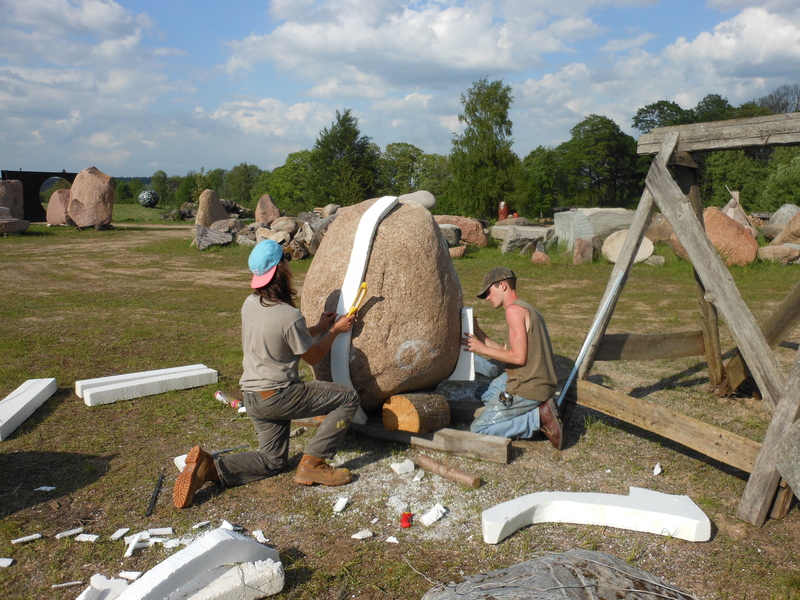 The sculpture was taken apart, and transported to the site. 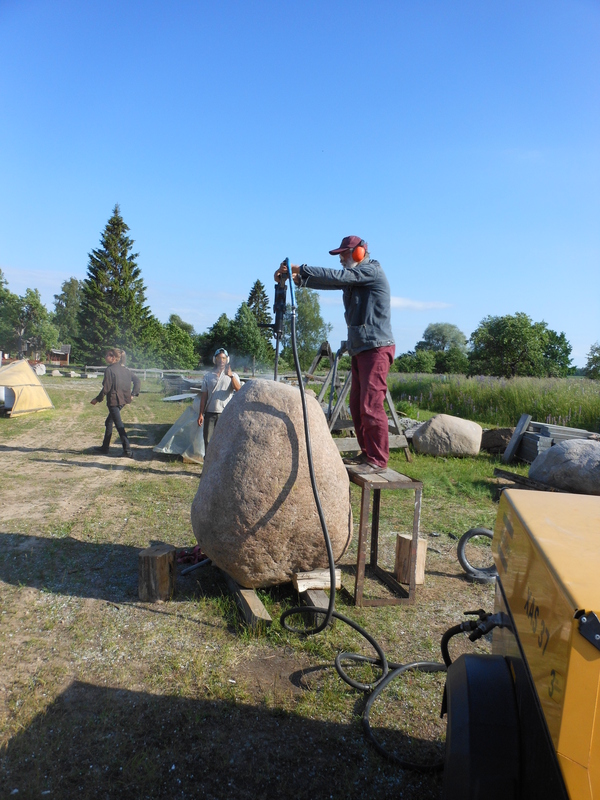 After being constructed there, the stone was adjusted, then set in concrete. 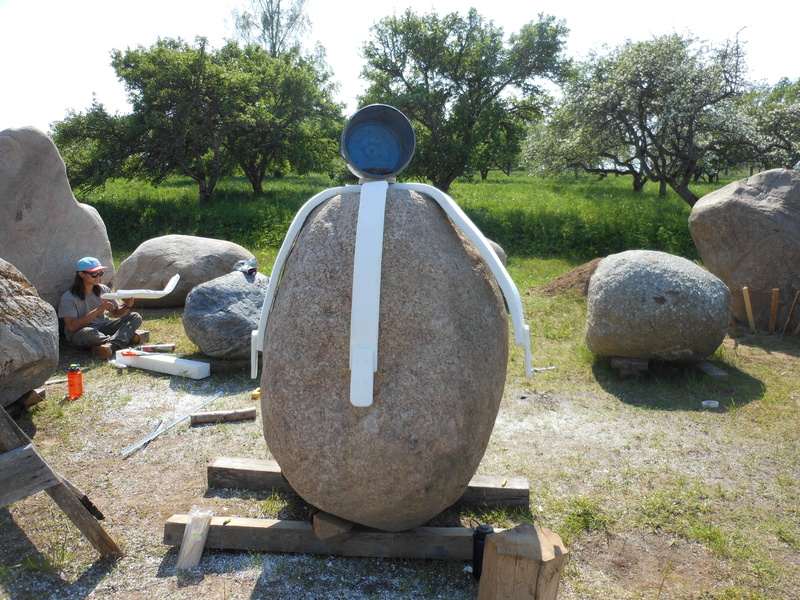 The sculpture sits is at 57 degrees 2.241 minutes North, 22 degrees 33.960 minutes East. 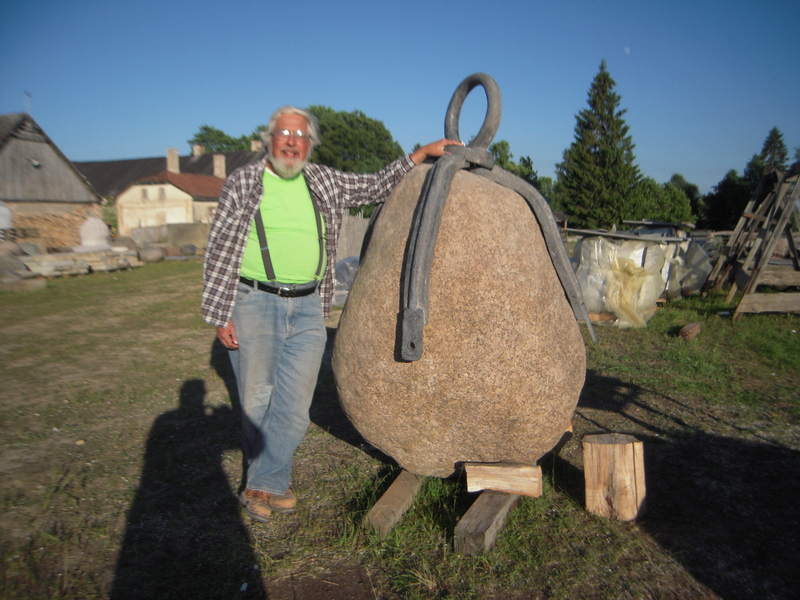 This entry was posted in iron, My sculpture and tagged cast iron, granite, iron, Latvia, Pedvale, sculpture. Bookmark the permalink. What is the meaning of Seshimori Ishi ?